Get the most comprehensive and easy-to-use system to help your loved ones lessen their burdens, save time and save money if you should become incapacitated or pass away. 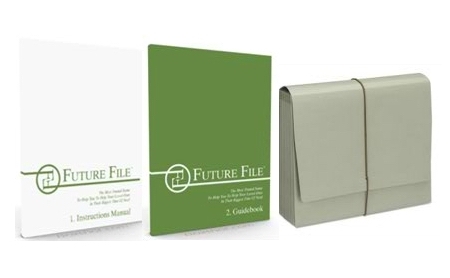 The hard copy of the Future File system helps you to organize your information, convey your wishes and provide a roadmap to your loved ones if you become incapacitated due to illness, dementia, etc. or pass away. Purchase one Future File per family member, as they cannot be shared. The Future File system software provides the same benefits and information as the hard copy, but allows you to read the instructions and fill in the information directly on your computer and provide your own folder or case for filing any documents (no folder included). 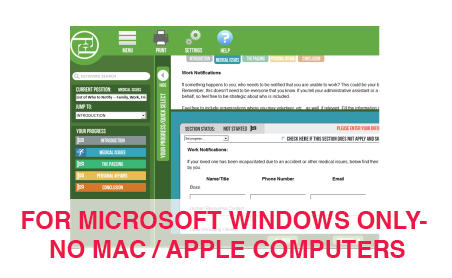 Purchase one Future File software license per family member, as they cannot be shared.